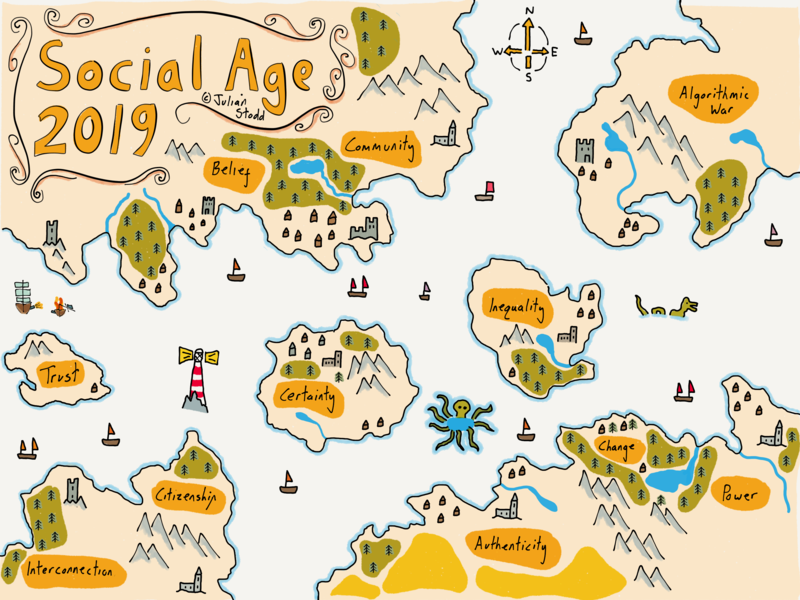 I’ve just completed writing all 13 primary articles, and now the final map to go with them: this will form the Social Age Guidebook for 2019, which i will aim to publish as a short eBook next month. I’ve really enjoyed writing and sharing ‘The Trust Guidebook’, and the ‘Social Learning Guidebook’, which has had over 500 downloads in the last week alone! The ‘Community Builder’s Guidebook’ is now in production, and then this one will follow that. These Guidebooks are short, highly iterative, and shared as imperfect work, part of #WorkingOutLoud, but they are all practical an applied, with sections on ‘what you need to know’, and ‘what you need to do about it’. This entry was posted in Social Age and tagged Cartography, Map, Social Age, Working Out Loud. Bookmark the permalink.